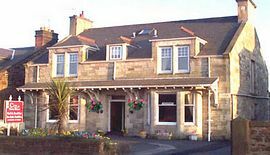 Coila, built in 1895, is an elegant Victorian villa, situated close to Ayr town centre and railway station, and handy for Prestwick International Airport. 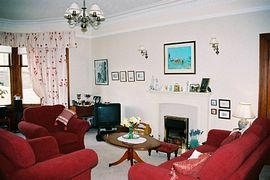 All bedrooms have en-suite bathrooms, and there is ample car parking at the front and rear of the house. 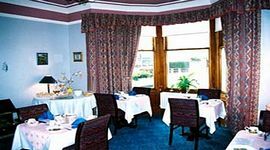 Breakfasts are a speciality, with home-made muffins and fresh fruit available each morning, as well as a traditional breakfast or even Scottish salmon. The guest house is totally Non-Smoking. 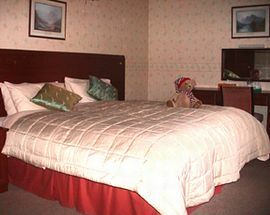 King-size beds in large en-suite rooms. Special Diets Provision: Special diets are catered for. Please give details of your requirements. 1. More scenic. Take A75 at Gretna towards Dumfries, on to Castle Douglas. Take A713 signposted Ayr, through New Galloway, Dalmellington and towards Ayr. At the roundabout on the A77, turn right onto the A77 for 1 mile. At the next roundabout, Holmston Roundabout turn left onto Holmston Road. 2. Faster. Continue on M74 until J12. 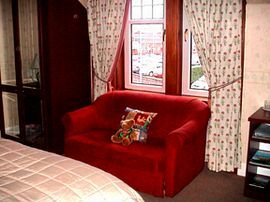 Take A70 through Douglas, Muirkirk, Cumnock and into Ayr. At the roundabout on the A77, go straight across, onto Holmston Road. Go along Holmston Rd, for almost 1 mile passing on left the cemetery and the a school. We are next on left with Red Sign.